up of different people such as it's club owners, managerial staff, club players, members and of course the fans. 11 Players that play the game of football are the representative of the football club. Over the years football has grown to become the most popular team sport in the world,the sport is a multi - billion dollar industry,soccer players are among the highest paid athletes in the world. In this post we are going to take a quick look at the top 10 richest football club in the world this year according to Forbes. We will also list other statistics such as the clubs current value,generated revenue and operating income. The most expensive clubs in the world can be found in some of the World's best football leagues such as German Bundesliga,Italian Serie A 1,Spanish La Liga and the English Premier League. These clubs generate millions of dollars through ticket sales,sponsorship,endorsements,merchandise sales,television deals etc,all these enable these clubs to generate millions on a regular basis. 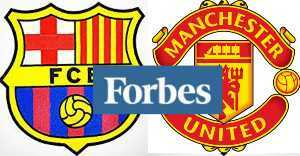 Listed below are the top 10 richest clubs in the world according to Forbes. Manchester United is the richest football club in the world this year with a current value of $4.123 Billion Dollars,with revenue generation of $737 Million Dollars and an operating income of $254 Million Dollars. Manchester United is an English club. Real Madrid is the 2nd richest football club in the world this year with a current value of $ 4.088 Billion Dollars,with revenue generation of $735 Million Dollars and an operating income of $ $94 Million Dollars. Real Madrid is a Spanish club. $4.064 Billion Dollars,with revenue generation of $706 Million Dollars and an operating income of $111 Million Dollars. Barcelona is a Spanish club. Read Also: Who Is The Richest Footballer In Nigeria? Bayern Munich is the 4th richest football club in the world this year with a current value of $ 3.063 Billion Dollars,with revenue generation of $640 Million Dollars and an operating income of $ 105 Million Dollars. Bayern Munich is a German club. Manchester City is the 5th richest football club in the world this year with a current value of $ 2.474 Billion Dollars,with revenue generation of $ 575 Million Dollars and an operating income of $ 133 Million Dollars. Manchester City is an English club. Arsenal is the 6th richest football club in the world this year with a current value of $ 2.238 Billion Dollars,with revenue generation of 531 Million Dollars and an operating income of $178 Million Dollars. Arsenal is an English club. 2.062 Billion Dollars,with revenue generation of $ 466 Million Dollars and an operating income of $ 67 Million Dollars. Chelsea is an English club. Liverpool is the 8th richest football club in the world this year with a current value of $ 1.944 Billion Dollars,with revenue generation of 462 Million Dollars and an operating income of $ 93 Million Dollars. Liverpool is an English club. Billion Dollars,with revenue generation of $442 Million Dollars and an operating income of $ 62 Million Dollars. Juventus is an English club. Tottenham Hotspur is the 10th richest football club in the world this year with a current value of $ 1.237 Billion Dollars,with revenue generation of $387 Million Dollars and an operating income of $ 141 Million Dollars. Tottenham Hotspur is an English club. The English Premier League has the highest number of richest football clubs in the world.